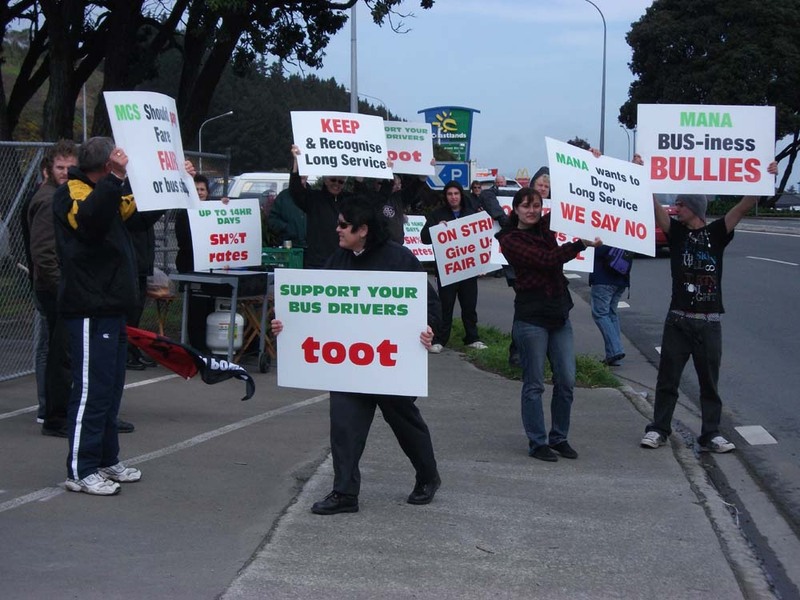 On August 31st drivers employed by Mana Coach Services went on strike at the depot outside Paraparaumu Station, an hour north of Wellington, New Zealand. The workers took the strike action after the company refused to budge on wage rates, despite the Tramways Union reaching a settlement of 11.5% over two years with two other companies in Wellington. Besides wages, atrocious work conditions were a trigger for the strike. These include the expectation that drivers work 14 hour shifts for 13 days in a row and Mana boss Geoff Norman recently firing a driver who arrived 10 minutes late for work due to having spent the night at hospital attending to his sick son. The picket at the depot was attended by about 20 people. Aside from tramways affiliated drivers, solidarity was given by the National Distribution Union, Rail Maritime Transport Union workers, AWSM and members of the public. The picketers were in good spirits as passing cars tooted support and Norman was heckled via a megaphone while skulking around the depot. At one point the RMTU members blocked the exit to the depot, causing a scab-driven bus to turn around and leave by an alternative exit. It is true that the numbers involved in the picket were small and Mana was able to largely keep operating. However, the active solidarity given to the workers by those in other unions and groups and the positive attitude displayed by all, are an example of the kind of fighting spirit that can still be undertaken even in the current difficult climate. On August 31st AWSM interviewed Nick Kelly, President of the Tramways Union during a picket of bus drivers employed by Mana Coach Services in Paraparaumu, north of Wellington. AWSM: Can you explain the background to your current action? Kelly: We’re on strike today because this employer has been bullying its employees for far too long. We’ve had them threatening people, that is threatening not to give them full time shifts if they don’t quit the union.They are sacking people because they turn up 10 minutes late to work, when their kid was in hospital. They refused to pay overtime rates, they refused to give drivers control over their hours of work, so they’re trying to make them work 14 hours a day, 13 days in a row, change their hours at a moments notice, and generally just making it as difficult as possible, for drivers to have any life outside of work, and then given all the best shifts, to the non-union members, so that the union members have the worst possible time. We’ve managed to get o.k settlements with the other two companies [Go Wellington and Valley Flyer] now, 11% increases, not so with Mana. Mana are just total scumbag employers and they need to be taught a lesson. AWSM: How long has this problem existed? Kelly: Its been going on for ages. We had a strike here 3 years ago and managed to make a few inroads, unfortunately because they’ve been bullying people out of joining the union, they’ve been able to continue to run it like a little fiefdom. Its quite disgusting that in 2010 workers can be treated as badly as they are out here, its just revolting. AWSM: And how do you see these conditions altering under the 90 Day Bill? Kelly: The 90 Day Bill is going to be bad, obviously. The worry is that people will join the union and on the 89th day you’re sacked. With the personal grievance stuff, we’re constantly taking personal grievances out here, they’re constantly trying to breach the agreement, to breach the law, if they water down the grievance process its one less protection for workers who are already in a really bad state and we wont even be able to visit the depots and if the employers are going to have to give permission for us to get on the depots, why would they give the union permission to come on here when they treat workers this badly? So the government is just pandering to these absolute bullies, absolute scumbags like Mana Coach Services who are getting their way with this National government law change, so we need to stand up and fight. AWSM: So with that in mind, what sort of actions will be most effective in the future? Kelly: Well, we’ve got to take industrial action. Obviously at this point we’ve only got a minority of the members, we need other workers and other people who want a better life to come along and support and protest and to stand up to bully employers and to corporates like this. This is a multinational corporation that’s making huge profits, sending them offshore, underpaying their workers, treating them like crap and we all need to stand up and say “No, you cant treat people like this anymore”. So people in New Zealand need to stand up and start fighting this sort of thing, because its not just Mana, its not just the bus industry, its all over the workforce and its going to get worse with these government changes. N.B. This interview has been slightly edited for clarity.